There has been much discussion within our sangha recently about abstaining from eating meat, and how this practice of abstinence applies (or not) in the context of tsog (feast; ganachakra) practice. Everyone's contribution to this discussion has been completely heartfelt and meaningful. At the same time, this discussion has made clear that much more careful and systematic study is needed of critical topics like how to differentiate and integrate the three levels of vows; how to interpret expedient versus definitive instructions; and how to coordinate conduct, motivation and view. I also must apologize for not yet having done an adequate job of explaining my own understanding of these topics on a common basis for all interested persons to examine and consider. Thus, at one and the same time, one sangha member feels compelled, through my influence, to entirely abstain from consuming meat, while another feels 'pressured' to partake of meat during feast practice. There are many authoritative treatises that articulate the inter-relationships of the three levels of vow on the Buddhist path. Prominent examples are "A Clear Differentiation of The Three Codes" by Sakya Pandita, and Jigme Lingpa's "Treasury of Precious Qualities." As each school of Tibetan Buddhism tends to rely on its own foundational treatises on this topic, I cannot recommend highly enough, for students in the Nyingma lineages, a careful review of the only principal exegesis of Jigme Lingpa's work published in English with which I am familiar, namely Kangyur Rinpoche's commentary published by Shambhala, entitled "Treasury of Precious Qualities," which also contains a translation of Jigme Lingpa's root verses. In particular, I refer readers to pages 293 through 316 of this book, which cover the root verses explicitly dealing with the manner in which one must hold and integrate all three levels of spiritual commitment, according to the Nyingma and Dzogchen lineages, and how the three relate to one another. Every important topic and consideration is covered here, including consumption of meat and alcohol. In short, the practices of the vehicle of individual liberation (pratimoksha) are largely conduct-based. One strives to protect and purify, and ultimately liberate one's being, by modifying and controlling one's actions of body, speech and mind. Because of the functioning of interdependence and karma, which are largely beyond the range of control of one's expedient behavioral choices and decisions, conduct modification, although a necessary foundation for all other practices, is an inherently limited and imperfect approach. One can be so austere as to live in a tree, wear a breathing mask, carry a wisk to clean the ground before one's feet, eat only nuts and berries, and so on, and still never be able perfectly to practice the precept of avoiding causing any harm to other living beings. Even if one is vegan, it is almost inevitable that beings are harmed in the process of delivering fruits and vegetables into one's mouth, and in a hundred or a thousand different ways. One may purchase products from diversified companies whose food divisions support the slaughtering of animals. One may keep pets and feed them meat products, or shelter them while they hunt and kill other animals. One drives a car whose windshield is a summertime slaughterhouse, and which depends on one or another form of energy generation that causes harm to living beings and their habitats. One landscapes, plants flowers, or mows the lawn, or one turns on electric lights at night that attract and kill insects, and does a hundred other unskillful actions each day that contribute to the suffering and demise of other creatures, even if inadvertently. It is not the case that one should therefore be less discriminating in one's actions. Rather, one must, eventually, recognize the fundamental limitation of this approach to liberating oneself and others from suffering and the causes of suffering, and look deeper. The bodhisattva level of practice is based on a deeper and broader appreciation of the inter-relationship of the two truths. That is, the identity of interdependence and emptiness becomes a prime subject of investigation and contemplation. Motivation, and intelligence, overtakes conduct as the principal drivers of spiritual practice. With a motivation to be of maximum help, and greater wisdom into the interplay of causes and effects on multiple levels, rather than shun all actions which, on their face, might inflict harm, one may elect to take on the karma of causing limited harm, in order to alleviate suffering on a greater or more lasting scale. The traditional example of this is killing the prospective murderer before he can assassinate 500 bodhisattvas, but certainly many examples are far less stark. Controlling insect or animal populations in a finite ecosystem, so that they neither overrun the system nor end up bringing famine upon themselves, might be another example. Taking life is no longer regarded as inherently the wrong choice in every situation, depending upon motivation and the application of skillful measures. If the pratimoksha vehicle emphasizes conduct, and Mahayana is primarily concerned with refined motivation and intelligence and skillful implementation of action, then the heart and soul of secret mantra is training in view. What view? As the master Mipham explains at length in his seminal overview of the Guhyagarbha tantra (itself the seminal expression of tantric outlook according to the Nyingma tradition), the view is universal purity and equality. This view is the basis, path and result of secret mantra practice. That is, no matter how phenomena might appear to a mind bound within the grip of deluded grasping and fixation, by their very nature they are all completely pure, empty yet apparent expressions of fundamental bodhicitta, or Buddha Nature. Nothing is truly impure, and therefore nothing finally is to be rejected, in order to realize the enlightened state. On the contrary, one must deliberately train in overcoming limited conceptions of every stripe. One does so for the very same purpose one also trains in discriminating conduct and refined motivation—to forever rid oneself and others of suffering and its causes. The vows of secret mantra are easily breached and readily repaired, whenever one forgets and wanders from, and then returns to, the view. The view subsumes all conduct, meditation, and motivational training, and yet never excuses lack of skillfulness. Karma'i Khenpo Rinchen Darjay explains, in a detailed instruction manual on preparation and use of samaya and offering substances in Vajrayana practice, that even while a root vow of tantra requires one to take life, the meaning of this is neither literal, nor in contradiction to the other levels of ordination. The life that one must disrupt is the mind's false projection of an independently existing and self-interested ego—call it rudra, or mara, or the demon of inflation (as in the chod practice tradition). It is the life force supporting such a projection that must be cut on the anu yoga level. It is ignorant grasping and fixation itself that must be released on the ati yoga level. Through one's view, and through the application of mantra, mudra and samadhi in the context of two-stage yoga, one transmutes and readily consumes all that before (and only apparently) appeared to one as inherently attractive or repugnant. This is the feast substance, and it encompasses all one's perceptions, not just taste. The Guhyagarbha tantra commands that we consume meat and alcohol as feast substances. These represent our passions and reified perceptions, grounded in ignorance. It is ignorance that must be consumed by wisdom, and ultimately enjoyed as the pure expression of wisdom, nothing more and nothing less. To enjoy the feast of sensory and mental experience transformed into the pure display of wisdom essence, we cannot revert to forms of conduct and motivation that are at odds with other levels of ordination. Thus, Rinchen Darjay explains that the five meats and five nectars are not only chosen because they are substances that are repugnant according to conventional tastes, but because the meats, e.g., correspond to animals whose lives are never taken by pure-minded persons in order to have food. Thus, to be literally used as feast substance, they had to have died by natural causes. Arguably, in the modern, global economy, where karmic connections among living beings are both highly attenuated and complex, picking up a packet of meat in the supermarket is virtually (although not perfectly) tantamount to collecting road kill. It is possibly the next best thing. Without such an understanding and view, of course, the mere act of consuming meat, with, at best, mere indifference to the welfare of the being from which it was drawn, can accomplish little more than impede one's cultivation of bodhicitta at the mahayana level. At worst, it can accomplish great harm. To guard one's precepts and spiritual commitments at all levels, one must respect each level of practice on its own terms. Thus, there cannot be an ordained sangha according to the pratimoksha system unless the vow to abstain from killing and causing harm is respected. The formal receipt of higher levels of ordination should never be treated as an excuse or pretext to disregard this foundational precept of the Buddhist path. When a rampant and degenerate practice has emerged of reveling in the consumption of meat and alcohol during feast practices, with passion, aggression and indifference to life that are not at all transmuted by wisdom or transformed into genuine compassion, and when such practice reflects badly on the sangha and the tradition of Buddhadharma, it is a highly skillful instruction on all levels, albeit contingent and provisional, to ban all consumption of meat at feasts by ordained sangha, until this rampant misconduct has been rectified. Thus, His Holienss the Karmapa pronounced, several years ago, that all followers of his lineage should refrain from consuming meat, including during feast practice. It is a remedial measure. The basis of this edict is the monastic precepts of the vehicle of individual liberation, but it is also perfectly motivated by the bodhisattva precept to guide beings to avoid doing further harm to themselves and others; and, when spoken by one with perfect wisdom, like His Holiness The Karmapa, it also springs from the view of great purity and equality that is the seal and samaya of secret mantra. But to be clear, this was not an instruction principally grounded in the profound view and samaya of secret mantra, and, under other circumstances, observing it would be a fundamental breach of samaya by those who are capable of following the tantric path and its precepts. I do not believe for a moment that His Holiness would deny this, just as I am confident that the previous Karmapa, living and acting in different times and working with different apparent circumstances, did not see fit to proffer the same instructions AND was no less wise or compassionate than his successor for it. Nor do I question for a moment that the paramount samaya is to observe one's vajrayana teacher's words and actions as a pure and perfect expression of wisdom and skill, whether one's tantric teacher is the Karmapa or someone else. Tantric students of His Holiness the Karmapa therefore must follow his command, whether or not they are personally capable of partaking of meat during a feast practice in furtherance of their tantric vows. Those whose connection to His Holiness is solely as a monastic preceptor, arguably, are not so obligated. If this seems controversial or unclear, please consult further with your own teachers, until you are confident in your understanding. In short, one must understand not only each level of spiritual vow and practice on its own terms, but also how they fit together in each situation. Beyond this, and even more important, one must proceed in a way that is true to one's own actual level of practice, and never be hypocritical or insincere. Nor should one be complacent, or refuse to entertain the possibility of enhancing one's practice of bodhicitta through cultivating a higher view. Such stubbornness, pride or rigidity is also highly problematic. And so, to seek out vajrayana (or dzogchen) teachings, while adopting only those principles and practices of vajrayana that fit neatly within one's own preconceptions and limited view, can be disastrous. 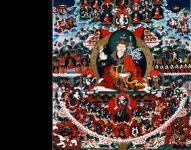 All of the principles Mipham explains in his treatise on Guhyagarbha tantra are of a piece; they all hang together as one magical tapestry, and it is the tantric view that weaves this tapestry together. In particular, to judge a tantric preceptor solely according to the parameters of pratimoksha ordination, or, conversely, to measure the quality of all preceptors solely by reference to their willingness or eagerness to engage in tantric conduct that appears to transgress conventional boundaries, only invites confusion, and will create lasting obstacles to one's own spiritual growth. 1 One should understand the practice of life ransom in much the same way. Even though one can never practice 'life liberation' in a way that perfectly protects the life of each being in the long or even medium term, one should not forsake this practice, because the bodhicitta training involved, and the application of skillful means and view according to secret mantra, make it vitally important and effective.